According to the Centers for Disease Control and Prevention, nearly one-quarter of American adults (22.7%) are living with arthritis. Arthritis is a health condition characterized by pain and swelling in and around your joints. Not only is the number of people who suffer from arthritis high, this condition can also lead to other health problems. Arthritis has been ranked the number one cause of disability in the U.S. after having been linked to 18% of total disabilities. The following banana bread recipe is made with chia and flax seeds, both of which are rich in omega-3 fatty acids. Commonly associated with fish, omega-3 fatty acids have anti-inflammatory properties and have been found to reduce inflammation in the body. As a result, diets rich in omega-3s are known to help people reduce their risk of developing chronic diseases, such as arthritis. Studies have even shown how participants with rheumatoid arthritis experienced a reduction in joint pain after taking omega-3 supplements. In addition to helping with inflammation, omega-3s are amazing for brain and heart health. Consuming these essential fatty acids can help delay the onset of Alzheimer’s disease and prevent cardiovascular problems. 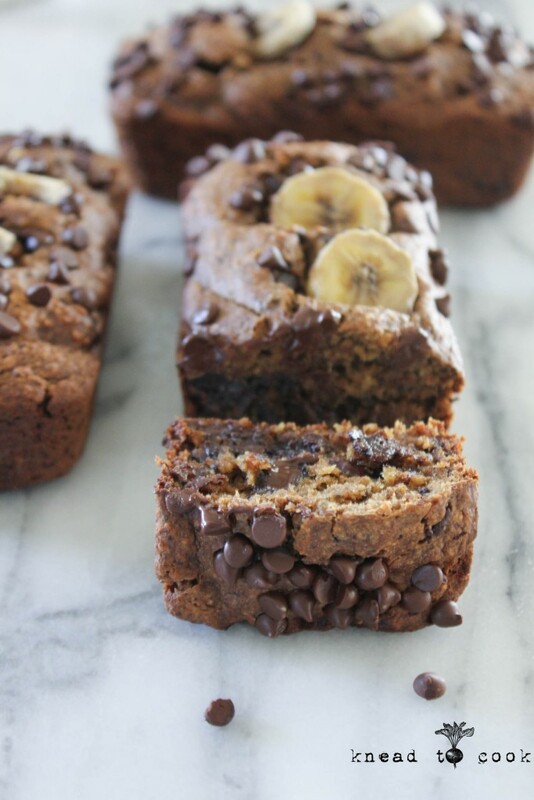 Try this delicious banana bread recipe for a sweet helping of omega-3s and boost your health. This recipe is shared with permission from our friends at kneadtocook.com. Preheat your oven to 35o degrees and spray your loaf pan/pans or muffin tins with coconut oil. Into your food processor, add your oats and pulse them until a flour is achieved. Then add the remaining ingredients through cinnamon. Blend until combined – scraping the sides down as necessary. If you’re splitting the batter up – making some with chocolate and some without – pour your batter into the pan/tins that you want without chocolate. Then return the bowl to your food processor and add as much chocolate as you like (1/4 cup is good). Pulse a few times to break up the pieces. Then pour into your prepared pans. I top with extra chips and banana slices but that’s optional. Let cool completely before slicing. Serve or store in an airtight container in the fridge.